Hi! I was in the mood for some colouring so I've made a card to enter to the Tiddly Inks Challenge. For this card, I've used the Happy Mail stamp set by Tiddly Inks. The glitter and sequins (by Pretty Pink Posh) are added to give the card some sparkles! To make it a Christmas card, I've added the christmas hat using a stamp set from Lawn Fawn called Hats Off to You and the tree is from Sweet Christmas. The sentiment is from Lawn Fawn too. Thanks for stopping by and I hope you like it! How cute...and clever! Love the intense colors in the image against the neutral background. 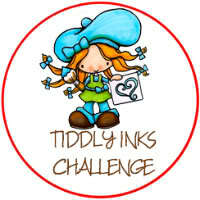 Thanks for joining us in the Make It Sparkle Challenge at Tiddly Inks! Just beautiful. I love how clean and simple it is, which really features your beautiful sparkly stamp! Thanks so much for playing along with us at Tiddly Inks!